Sage and his buddy Dandelion are a bonded pair. They have been together their whole lives and take comfort from being around each other. Sage is super sweet and loving. He is still getting weekly medicated baths for a noncontagious skin condition. He and Dandilion are under 5 lbs so they would do best in an adult home or one with older children that can appreciate how delicate they are. 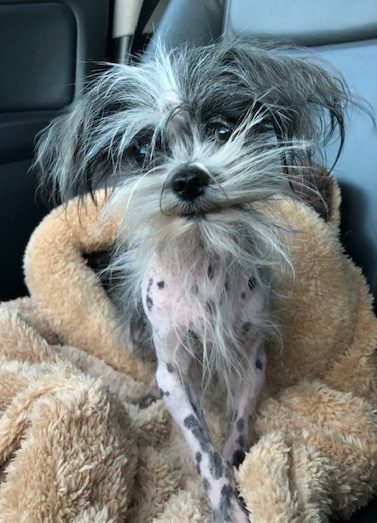 We’re pretty sure he is a Chinese Crested mix, but it’s possible he will grow hair once his skin is better. Sage has a lower energy level.